Size of Male: 13-15 lbs., 10-11 in. Size of Female: 13-15 lbs., 10-11 in. Appearances can be deceiving, and this is the realization that many pet owners reach when raising a Lhasa Apso. Beneath the cute and cuddly look of this long-haired breed lies the character of a lion. In fact, most books will warn you that the dogs are the toughest and most vigorous of all tiny canines. 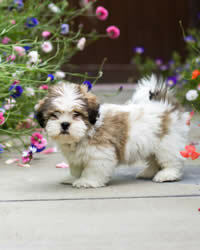 Lhasa Apsos have a resounding bark that belies their size. Lhasa is actually a sacred Tibetan city while “apso” literally means “long-haired dog.” In other records, “apso” is believed to be a corrupted version of the Tibetan term for goat “rapso,” and this theory isn’t far-fetched. All the hair that meets your eye somewhat resembles a goat’s coat! These pooches were the steadfast watchdogs of Tibetan monasteries and temples, where the breed was conceived. Buddhist beliefs suggest that the canines are not only temple guardians but are also the reincarnation vessel of lamas. In 1933, the 13th Dalai Lama sent the first batch of Lhasa Apsos to America as gifts of goodwill. These once-sacred pooches now grace dog shows and take comfort sleeping on the laps of their favorite masters. Whether inside your home or out in the open air, the dog makes an excellent human companion and a reliable watchdog. It sports an acute auditory sense, coupled with the ability to bark loud warnings. Its jealous nature, however, doesn’t make multi-pet ownership a ready option. This dog breed is rather sensitive to rough physical contact and intolerant of the most well-meaning teasing. They will literally bite when angered or shocked! Carefully planned social exposure is important so that your dog will not grow up to be suspicious or overly defensive. Living Environment – Space is not an issue with this small dog breed but adequate socialization is crucial. The dog will gladly snuggle with you in bed and follow you outside. It wants you to be around all the time but can adjust fairly well to either country home or apartment living. Just remember to keep your place cool for the dog as this breed is somewhat intolerant to heat. Grooming – For a medium shedder, these little dogs have high grooming requirements that must be met through daily brushing, weekly bathing and quarterly clipping or trimming (especially of the hair surrounding the dog’s rump). You must also check constantly for parasites, skin allergies and ear infections. Diet & Exercise – A high-fiber, high-carbohydrate diet is optimal. Protein from fish and poultry are likewise essential. Their Tibetan roots make this dog breed well adjusted to eating rice. Some sources recommend finely mashed bones that are blended with minced beef (for pups) and minced chicken (for adults). The breed may be active, but its miniature size largely accounts for the low exercise requirements. The dog can stay at home the whole day, requiring only short walks or a brief indoor game of catch and fetch. Health – In the health department, the Lhasa Apso succumbs to kidney trouble the most. Skin allergies are also common but these are indicative of parasites in the pooch and can be addressed with proper hygiene. Other conditions that are found in the breed include cataract, luxating patella and bladder stones. Arrogance and obstinacy make this dog breed very difficult to housebreak and train. You must be able to show the Lhasa Apso that you’re the alpha leader at all times before the dog will even consider listening to your commands. Positive reinforcement methods are a huge help, but nothing beats the benefits of early obedience training. If you use the highly recommended crate training method, give yourself half a year for puppy potty training your Lhasa Apso.